paul gregutt's washington wine blog – unfined & unfiltered: score! Although the 100-point scoring system has been railed against and ranted about for decades, and its demise often predicted, it is an undeniable truth that both the wholesale and retail trade take full advantage of it when it is an asset in selling wine. Not a day goes by that I don’t get a dozen or more emails from various wine-sellers promoting wines with good scores. And believe me, as someone who has been a paid wine scorer since 1998, I have absolutely no problem with it. There are wineries that make a lot of noise about how they hate scores. They start anti-score clubs, and some take great pleasure in haranguing critics for (gasp!) doing what we are paid to do, which is review wines and score them. If scoring wines is really something that should be stopped, these self-appointed Guardians of the True Faith ought to take on the distributors and retailers, not the critics. I mean, who is making big money from these scores? The wineries! The distributors! The retailers! Am I the only one who sees some hypocrisy at work? Listen, I applaud those who take full advantage of good scores. It’s good business. More than that, I totally respect and value those who attempt to learn from scores that are perhaps a bit less than they felt they deserved. My own feelings about scoring are well-represented in both editions of my recent book – Washington Wines & Wineries: the Essential Guide. I am well aware of the pitfalls and limitations of the 100 point system. But I also recognize that it is in many ways the most concise and useful rating system ever devised for wine. Which is why it has been widely adopted, and is likely here to stay. For those of you who – as knowledgeable, informed, value-seeking consumers – want to taste through a very fine lineup of (Yes!) 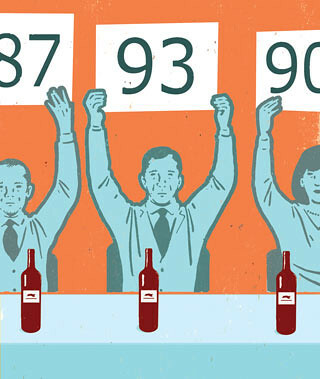 high-scoring wines, I recommend this upcoming event sponsored by Woodinville Wine Country. On Friday, April 12th at Columbia Winery, over 40 Woodinville wineries will gather to pour wines rated 90 and over from major wine publications. There will also be special wines too limited in quantity to have been reviewed, and gourmet bites from local Woodinville restaurants. Cost is $75 – probably about what you’d pay on average for a couple of bottles of just one of these wines. Funny, I don’t see the names of any of the score-haters on the list of participating wineries. Guess they’ll just miss out on a very good chance to show their best stuff to some very savvy consumers.